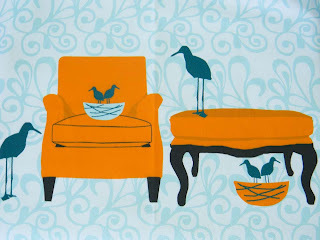 Laurie Wisbrun | Scarlet Fig: My Sewing Machine Cover AND a Nesting Chairs Giveaway! 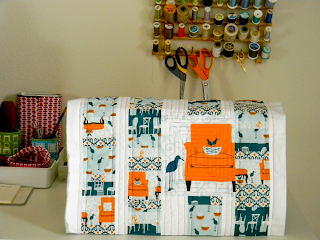 My Sewing Machine Cover AND a Nesting Chairs Giveaway! I have a list of things to-do that's a mile long. And absolutely nowhere on that list does it say 'go make something for your sewing room.' But this last weekend I set the ever present to-do list to the side and made myself a pretty sewing machine cover. 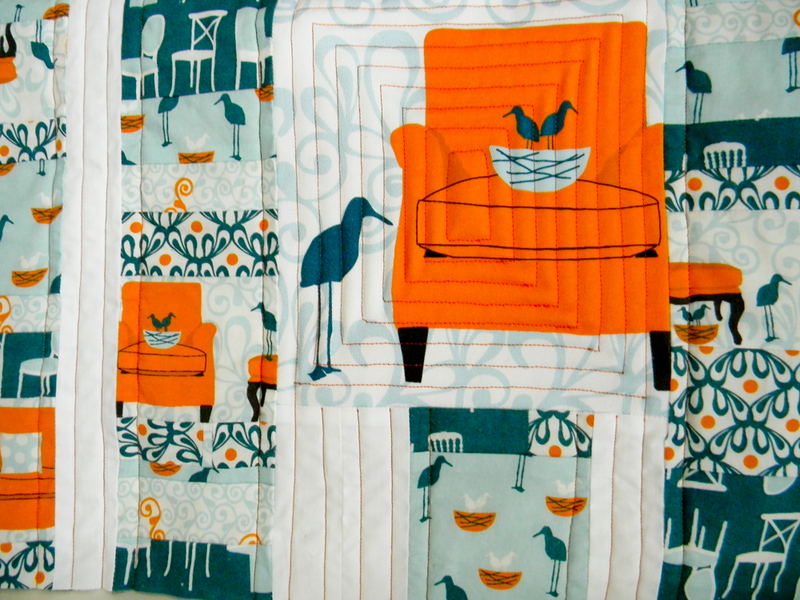 I used my Nesting Chairs fabric and the matching Nesting Chairs pillow panel (for the big chair in the center). I pieced it together in strips with white sashing and quilted it in stripes and a concentric box. All that's left to do it make and attach the binding and add grommets with ties to keep the sides closed. I'm thrilled with the way it's turned out so far. I love little projects like this so I can actually finish them. I think I worked for 3 hours or so on Saturday and it was a great diversion and really fun. (Insert sheepish grin here...Remember that duvet cover I started a while ago? It still sits unfinished. I've finished piecing the top but haven't quilted it/assembled the duvet pocket...I hope to get that finished soon...) So, I'm hoping my machine cover project may have inspired you to tackle a quick and fun project (that's not on your to-do list!). 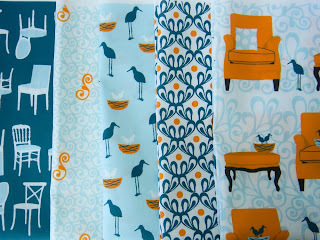 I'm going to give away a FQ set of Nesting Chairs in Aqua/Orange + 1 Pillow Panel to one winner. Yahoo for giveaways, right?!? Well, since my 3 year old claimed the last pillow I made that I had intended to use on my couch, I'll use the FQ bundle to make myself a new one! Or two.. or three.. As many as I can! I would definately make pillows for my brown sofa - I think the colors would be beautiful! i love blue and orange. it seems like a great combo for a baby quilt and a matching pillow. i'm going to be an aunt sometime in august--that's probably what i'd use it for. Such fun fabric! I would probably use mine for a super cool and funky tote bag! Or maybe a small quilt! I'd have to look at it for a while before deciding! Ooooh, I might have to use it to make a sewing machine cover for myself -- I love yours! Thanks for having this giveaway! Hard to decide but probably a cover for my serger - I have been meaning to make one forever and seeing your new cover has inspired me! Thanks for the great giveaway! I love all your fabrics. I would probably try to incorporate it into a quilted couch cushion or maybe an apron. What an awesome cover! And I love those prints; they would look great turned into pillows for my son's room (and would go perfectly with a quilt I have planned for him). I really need an organizer for our magazines and remotes - it'd look so great hanging off the arm of our couch!! I'd like to make a quilt with it. Oh my goodness you cover came out so cute!! I adore this new line of your Laurie and desperately want to get my hands on it!!! If I did it would most likely go into a quilt, or a mini quilt for my sewing area! yahoo! I would love to see some cushion covers in this fabric. Thanks for the chance! My sister is having her first baby, so I would definitely use the fabric to make something for her and baby. Great neutral colours. Thanks for running the giveaway! Wow, that looks great! I've had a sewing machine cover on my to do list for years now; this is a great idea! This is such cute fabric! I'd make a mini quilt to hang in the sewing room, if I were the lucky winner! So cute...can't wait to see the finished product. I'm envisioning some great wristlets/zipper pouches. I love your nesting charis they are so stinkin' cute. I just joined a swap for sewing machine covers that will be fun. I think I would use it in my kitchen and family room (they flow into eachother) because the colors match what I am working on there. Pillows and a table runner.... fun fun! I would use it for some new pillow covers for my living room. I really want to stick to decorating in teal and orange. I think these would be perfect. I'm thinking a tote bag, though I'd really love a throw pillow or two with that yellow-background pillow panel. Fun colors . . . I'm a quilt lady. It would be fun to snuggle under a little quilt with chairs on it, while sitting on a big fluffy chair and read a book about birds ;) Thanks for the chance! I would love to make a quilt out of these fabrics!! The prints are so much fun, and the colors are right up my alley! Thanks for the chance towin this! I love these colors, and I'd definitely want to use the fabric in a fun, cuddly lap quilt. Thanks for giving some away! I need a pretty sewing machine cover, too, and a pillow for my aching back! Thanks for the chance! I have to admit that I would be a little selfish and make myself a quilt! I just love this fabric and I'm not sure I could part with it!! omigosh..way to beautiful to cut..I'd make framed wall art! Love, love the orange and aqua colorway. It's my favorite combo! A sewing machine cover is a great idea. Yours is beautiful. My current cover is white plastic nothing-ness that came with the machine. Or a pillow. I need to make more pillows! Love this fabric. I would make pillows for my couch that needs some happiness. A quilt! Yay for giveaways! definitely a quilt for my daughers room! I would make a quilt and pillow for my living room. I absolutely love this color combo! Oh, I can't decide right now! We're buying a house and I want to have a craft room...I might use this fabric to accessorize said craft room in some way! Love your sewing machine cover...nothing like a little (almost) instant gratification! Thanks for a chance to win your great fabric...I think I'd make a pillow with it! I would love to make a pillow! I love this fabric! Love your sewing machine cover! These little inbetween projects are usually the ones I enjoy doing most! If I win I'd probably make a quilt or some pillows. I would make a zipper pouch with it. I travel a lot with my work and these things save me -- I never seem to have enough. Honestly, I would love to make a pillow with these! They are soooo great! I really LOVE the colors! So cute! I am going to baste a Tufted Tweets quilt tonight! I didn't think you could outdo the TT, but I think i like the new line even more. I'd love to make some throw pillows with the new line, i think my living room needs a facelift! Oh Laurie, how wonderful it would be to win some of your beautiful fabric. I need a sewing machine cover - what a great idea! I hope I win. Thanks for sharing your beautiful creations with all of us! Wowww, I'd love to make some absolutely crazy pillows fr my sofa! Love the new header... I haven't clicked over from my reader since you've changed it! Anyway, wow, I would love to make a quilt and some chair pads for my sewing room and pc chair. I spend a lot of time in both! thank you! Simply one of the most fun and fabulous fabric lines ever! I have 2 vintage rattan chairs under my staircase. The original pillows (currently tucked inside cute pillowcases) are that horrid orange and brown 70s floral tweed. I plan to paint the chairs in a bright happy color, and I would LOVE to use this fabric to recover the chair cushions! Oh Laurie... this is my favourite yet :) The colours are delicious. After 5 years of hand me down furniture we are going to buy a new couch! Which will of course need cushions... I'd use this fabric to make some lovely cushions so that I could see those little birds everyday. Thank you! Yahoo for giveaways indeed! :) Not sure what i would do -- no doubt they would sit on my sewing shelf while I oohed and ahhed over them for a good month+ before I could bring myself to cut them! I'd love to mix them patchwork style... Maybe a suite of coordinating notebook covers? I would love to make something for my daughter who keeps saying...."Mom, why don't you stop reading blogs on my laptop and go make something!" I love this new line! I would definitely use these in a baby quilt....for a friend. The little nest and the colors...perfect!!! A bag.. I would definitely make a bag out of it! I'm looking for some new funky fabric to make chair pads with! I'll make a pillow for my new living room. We're moving this week to a neighboring state... exciting times! The fabric would make a super cute pillow cover! Thanks for the giveaway! Your quilt is beautiful! I would use the fabric in a quilt as well since I'm a quilter. I absolutely LOVE the aqua and orange together!! Gosh, I'd probably piece a dress for my daughter - she's 1. I think that would be totally wild. 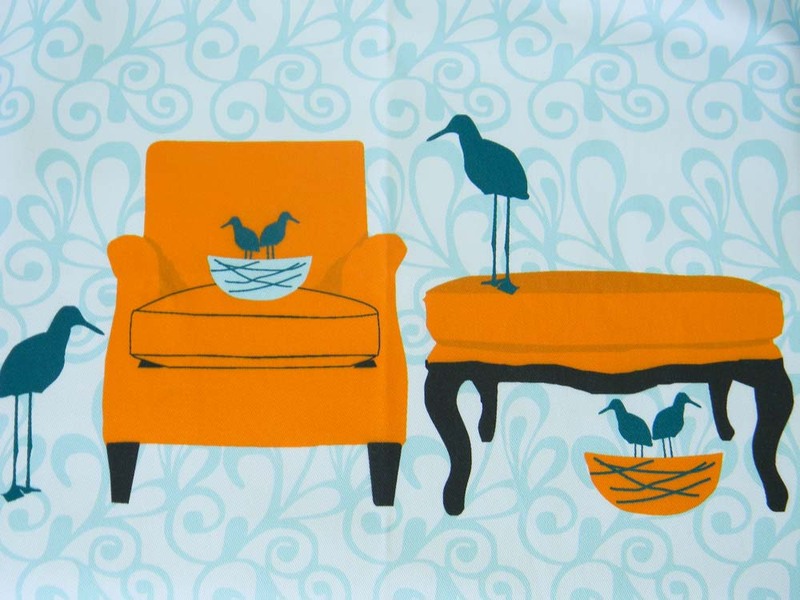 Who'd make a dress for a kid with chairs and birds fabric??? No one else will have one like it, that's for sure! Those colors would be perfect to make a little pillow to go on the orange chair in my blue craft room! Those colors would be perfect for something to the hall at my home - I should only add purple solid and it would look great! I think I'd make a pillow with it! Thanks for the giveaway! Oh I have a pattern for a reading pillow with tabs to hold your book and a pocket for your glasses, I want to make one of those and this fabric would be so great. I have been eyeballing this fabric for a pillow, but oh my goodness, I love this sewing machine cover!!!!! I may just have to do this, win or not!!! Cute!!! Love this fabric. I'd probably make some accent pillows for my room. Oh my! Can I just say that I think I might like this fabric even better than tufted tweets? I didn't think it was possible. Honestly, I would probably hoard it for a while, until I found the perfect project, but I think it would find it's way into a quilt. I'd love to make a bag with it. Or maybe a quilt for my little boy. It's so cute--I love those colors. i definately think some fabic baskets and possibly even a quilted pillow would be stunning in this fabric! LOVE the fabrics, the colours, and everything about them! I think they are screaming to become a new spring throw quilt for our couch! I'd probably make some kind of pillow with it - I find my stash perpetually short on orange, so I'd have a hard time pairing the fabrics with what I've got (I am on a fabric diet - no more new fabric for me, at least till I finish my goal projects for the year...) to make anything bigger. Wow, awesome giveaway. I would love to use these in an orange and aqua quilt! Thanks! I love your fabric designs!!! What would I make? I don't have a specific idea in mind, but something decorative and functional would be the best use. That way I can use it and look at it, 'cause it just makes me happy! I love love love that fabric and the colors!! I would make a quilt, a nice bright cheerful modern quilt! That's lovely. I'm thinking I might like to use these to dress up my office a bit. A pillow for the chair and maybe a little wall quilt so I have some pretty art to look at. I think a lap quilt and cushion for my couch !! Love your work. I just adore the colors and designs of this group! My favorite colors and a beachy look! I'd make a summer table runner for the dining room. i think a sewing machine cover would be in order--:-) thanks for the chance to win your great fabric!! I would love to use this fabric in my sewing room. I have a small white love seat in my new space that needs an "attention getter" pillow. And I would love to make a cover for my machine. Yours is the second cover I have seen. Great Job!! I'd love to make a mug rug (or two) with the FQ bundle. I'd love to make a sewing machine cover as well. Thanks for the chance to win! I have been making quilts for over a year now, and have not kept one yet. I am wanting one for MY bed, and these prints are just the colors I have been thinking of. And of course, anything with birds I adore! Awesome of you to share. Yay! They'd make some great pillows for my living room. I was thinking a couple pillows or a quilt...though now that I see your sewing machine cover, that looks like a good idea too! I love the color combination! Ohh, I would definitely make a pillow with the fabric. It would be for my bed. All the sofa pillows end up in my kids' play tents. What I already bought I'm hoping to use in a quilt! But the sewing machine cover is giving me other ideas! I'd love some of the aqua, too! I really need some more patchwork pillows and this would be the best excuse ever! a pillow, a magazine bag holder, an ipad case....and I could go on and on. Your cover looks so cool!!! I would absolutely use this for pillows for my living room. The colors are fabulous! I would so make a cushion for my living room and a matching mini quilt, or maybe a new lamp shade! I'd supplement these gorgeous fabrics with a few complementary tone-on-tones and make Elizabeth Hartman's "New Wave" quilt. Thanks for the chance to bring home fabric I've been wishing for! I think id use it to make some gorgeous cushions,Id love to make a sewing machine cover like that but fear my skills are not quite at that level! Oh! I love them! I really don't know what I would make yet. I like to stare at the pretty stacks of fabric for awhile before deciding! 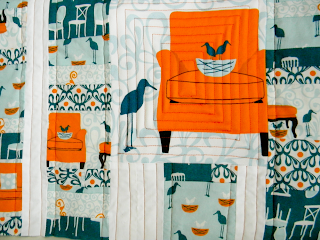 I am planning a baby quilt in blues and orange and Nesting Chairs would go great in the quilt. The baby is due in July so I have a bit of time. Thanks for offering the giveaway! (And nice job on the sewing machine cover - it looks great). I would love to make some covers foe stools in my kitchen along with pillows for my couch. LOVE the new line...congrats! I'd love to use your fabric for my first attempt at a small floorcloth for my living room entry. Wouldn't that be cute? thanks! I think I'd put together a really fun lap quilt to toss on our sofa in the living room. Thanks for the chance, Laurie! I'd use this great new fabric for quilts, quilts and more quilts! I would make a reading pillow, like the ones from my childhood, y'know, with "arms", it kinda looks like the top of comfy chair? I've been wanting to make one of those for ages, so I can sit up comfortably in my bed at night (when I'm not in the studio!) catching up on all my quilting/crafting blogs and flickr pools! Thanks! I think I would make myself a new wallet...I love these colours! My mother lives on a lake with herons. I would make pillows or a throw for her. Beautiful colors. 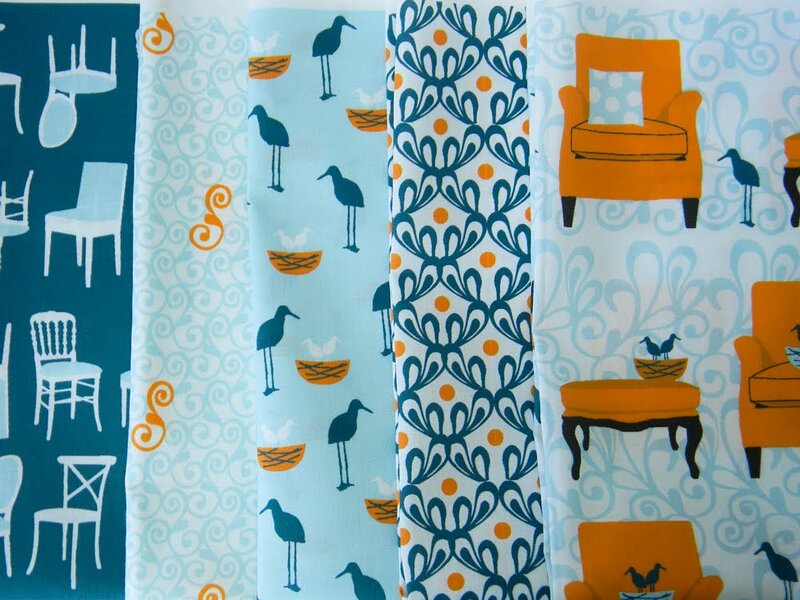 I have some blue floral fabric that would match the cranes exactly so I would probably use them all to make my daughter a knot dress, with a new pattern I just got! I need a small cover for my new phone and a lunch bag, this would be perfect. Those prints would actually make a great little pillow for my newly-blue bedroom. We switched bedrooms when our new daughter came home, and I vowed to make this new room as cute as possible (I was never happy with the other bedroom). It's still a work in progress, but it's looking better every day. A pillow for my corner chair in my bedroom...a chair for watching the birds out the window, knitting, reading, etc. Love my chair. It even has a tiny thread of orange running through it. The fabric would be perfect. I would like to make a set of couch pillows with piping. I love Tufted Tweets, and I had never seen Nested Chairs. I love the semi-ironic statement of making a couch pillow out of material that depicts couches and chairs to begin with! The thought tickles me very much, and I've been itching to create this project. Love your sewing machine cover. I might make a pillow. Or a tote. Or a wall hanging. Or . . .
Curtains for my new kitchen. i have been looking for the perfect fabric, I just found it. Wow! I love your fabric design! I'd love to win it and I'd want to make pillows for sure! Wow, great fabric. I would love a pillow or even your super cute sewing machine cover...I have yet to make one and really need to. it would have to be a pillow or two I think. I love this nesting fabric. It's so cute. I like the sewing machine cover too. If there was any left over from pillows I'd work it into a sewing machine cover. I would love to make a cushion for my sisters sewing room chair and maybe a valence too for her window in there! thanks for the lovely giveaway. Love the colors! I'd make myself a bag. A pillow and a baby quilt for a granddaughter. Thanks for the awesome giveaway. Most definitely a pillow to perch on my new orange chair! Orange and Aqua are my favorites!! I would definitely make a small quilt for my sun room! A wall hanging for my orange den! The colors are perfect! I sense a sewing machine cover similar to yours coming on! That's stellar! Definitely a wall hanging. Love looking at that darling fabric! I absolutely love this fabric, especially the color combination, and would make a tote bag to haul my gym stuff and use it daily! that fabric is amazing, and the colors are great together- i would use it to make a fabric basket to store my goodies in! well, my ironing board is in DESPERATE need of a new cover, and if I won, I'd use these drop-dead gorgeous fabrics to sew one up, and every time I'd iron something (no, not shirts! Fabrics! ), I'd be smiling. The fabric just makes me smile. I love it! I would love to use it in a quilt for our living room. The colors are perfect! Laurie - I do the same thing. I took time out from altering folks clothes the last couple of days to finish sofa cushion covers that sat cut out for at least a year and to stitch up a doggie bed for our new addition. Thanks for the chance to win. I would have to marinate the ideas for a while if I won your fab fabric but it would definitely be something just for me! This fabric is begging to be made into a pillow for my sofa! My kindle needs a cover too. I love this fabric! I would so make placemats for our dining room table out of it! We just bought a house (tonight!) and I will have my own sewing room (swoon! ), so I am in need of fabulous fabric to make fabulous accessories for my fabulous-to-be room! Thanks for the chance to enter! OMG! Love, love, love your new line!! The colors are fantastic. I would use the fabric to make a funky patchwork wall hanging for my orange sewing room. I think I would make a book bag or some sort of air plane travel bag. The birds just need to be kept moving in some way. Hi I just discovered you via print and pattern. I love your design - would make cushions for my living room sofa. I'm a fabric design wanna be not going anywhere at the moment, but still trying. My blog: www.thehomelyplace.blogspot.com. fabulous laurie! i definitely think that these fun little projects should sometimes take precedence over your list of to dos. everyone needs a quick and fun project!! I would love to make a cute apron! would totally make a cover for my e-reader ... and a pillow too if there was enough left over!!! I'd really love to make a piece of wall art/a hanging quilt to coordinate with the Tufted Tweets pillows I have planned! These fabrics are so lovely. I probably would make them into something for hubbies corner in my sewing corner and maybe a cute tiny pillow for my sewing chair. Guess this world needs more pillows because like so many others, the pillows on my couch are so tired that I would love to win and make some new ones. But I would leave enough for a small bag to carry around and show off the great fabric. Love your cover. It looks fab! If I am lucky enough to win, I'd make a throw and matching pillow for the couch in my sewing room. I would make an awesome bag, so I could take that fabric with me everywhere. It's beautiful. I really like this collection, well any of your collections are awesome, but the teal and orange are just wonderful. I think I need to make a sewing machine cover too. I just got my Bernina back from the shop and the technician said it was the most dirty sewing machine she has seen in ages. Maybe a cover will keep some of the dust off. i would totally do a pillow AND a little array of wall hoops to go on/over the loveseat in my front room. I'd make a pillow and maybe a little zippered pouch to give away to one of my knitting friends. I didn't think my sewing machine (janome MC6500) needed a cover, until I saw yours! My couch is in need of a new lap quilt, so, yeah, that's what I would make. Thanks! This fabric is beautiful and the color scheme fits my new craft room decor just perfectly! I need a new pillow for my overstuffed chair, pincushion, sewing machine cover, inspiration board, and valances. If I can figure out some way to get all those projects out of a fat quarter set . . Well, at least it will be a great start! Thanks for the chance to win! A tote bag and notebook cover would look fab in this! Oh my what a fantastic sewing machine cover! I just got a new quilting machine and it desperately needs a sewing machine cover and your fabrics match my sewing loft perfectly! Such cute fabric! I would make a really fun beach bag with this and save all the scraps for mini-quilts for my friends. Thank you. Oh I forgot to leave my email.. I love those long-legged birds and can't wait to make a fun beach bag if I am lucky enough to win. Thank you! I would make a sewing machine cover if I win, I certaintly could use one. Great giveaway.